Please Note: We strongly urge the use of safety goggles when using any file or abrasive. It is especially important to wear safety goggles instead of safety glasses when using steel wool. require emergency medical attention and result in permanent eye damage. Specialty color-coded grits for snading, buffing and polishing metal. Half-Round files are tapered in width and thickness, coming to a point. Double cut on both sides. 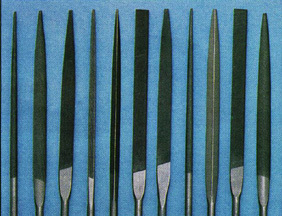 Hand files are parallel in width and tapered in thickness. Double cut top and bottom. One edge single cut. One edge is safe. SET OF 6 TELL-SWISS files # 2 Cut. (Most Popular) In a Vinyl Pouch. SET OF THREE NEEDLE FILES: Economy grade # 2 Cut. file, for use on ultra-hard materials. This set is medium grit. This economy diamond file set offers good value, but they are no where near as precise or durable as the Grobet files above. Triangle Needle File with dipped PVC handle, 11.3 cm (4.4 in) long, tapered from 3 - .5mm (.12 - .02 in) . The Grobet files below all have tangs. The size indicated is the length of the milling surface. Swiss cut. Parallel in width and tapered in thickness. One edge is safe. Slot for emery cloth for sanding the inside bracelets and rings. Fits onto the tapered spindle on your polishing machine. 3M 220 GRIT WET OR DRY SANDPAPER 9" X 11"
3M 400 GRIT WET OR DRY SANDPAPER 9" X 11"
3M 600 GRIT WET OR DRY SANDPAPER 9" X 11"
See important safety message at top of page. # 0 Fine STEEL WOOL - 8 pack Stock number does not exist: "AB-SWL-0"
# 00 Very Fine STEEL WOOL - 8 pack Stock number does not exist: "AB-SWL-00"